• Raw plantain (skin peeled and sliced) - 2 numbers. • Rice flour - 2 tablespoons. • Red chili powder - 1+1/4 tea spoon. • Dry red chilies - 4-5 numbers. • Channa dal - ½ tea spoon. • Urad dal - ½ tea spoon. • Curry leaves - 2-3 springs. • Garlic (chopped) - 6-8 cloves. • Green chilies (slit) - 4-5 numbers. • Coriander leaves(chopped) - 1 cup. • Curd - 1/4 number. • Lime juice - 1 number. Peel the skin of the raw plantains and slice them into roundels (neither too thick nor thin). Put them in salt water. In a mixing bowl, add rice flour, salt, ginger garlic paste, red chili powder and make a thick paste by using water. Drain off the water, add the plantain slices in the rice flour paste and mix well to coat the plantain slices well. Heat oil in a kadai and when the oil gets hot, drop the batter coated plantain slices into the hot oil one by one and deep fry them until crisp and golden in color. For tempering, take some oil in a pan and when the oil is hot, add dry red chilies, mustard seeds. When mustard seeds splutter, add chana dal, urad dal wash and fry until slightly roast and golden in color. Add turmeric powder, salt, curry leaves, chopped garlic, slit green chilies, red chili powder, pepper powder, chopped coriander leaves and little curd, mix all the ingredients well for about 2 minutes. Then add the fried raw plantain slices in the curd mixture and toss well. Squeeze little lime juice and toss once again. Switch off the flame and serve hot. Raw Plantains are a low glycemic source of carbohydrate and full of nutrition. 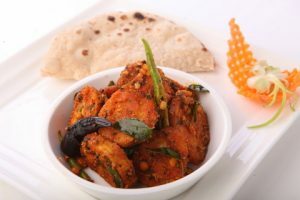 Aratikaya as its known in Andhra is a regular everyday vegetable in South Indian vegetarian cuisine. Deep fried plantains coated with a batter of rice flour are mixed in tempered curd or butter milk which gives a rich flavor to the dish. Stir Fried Plantain with Yogurt makes a perfect side dish with rice, sambar, and papad. Stir Fried Plantain with Yogurt is a brilliant dish made with subtly spiced batte... Read More..
Stir Fried Plantain with Yogurt is a brilliant dish made with subtly spiced batter coated deep fried plantain added in a seasoned spicy and flavourful yogurt mix drizzled over with little lime juice to give an amazing savour to the dish. Kids would love eating this type of a dish as it’s very soothing, refreshing and unique to taste. Seasoned with some fantastic spices, lentils, fresh herbs and garlic flavour combined together enhance the taste and gives a nice crunchy feel on eating. Yogurt is extremely soothing, refreshing and cooling to taste. You could eat this side-dish with roti, chapatti or rice. Yogurt or curd is a versatile base widely used in marinating; making of various relish/ dips, exotic and delicious gravy based preparation. It is an intrinsic part of many culinary cultures. Deep fried plantains coated with batter of rice flour are mixed in tempered curd or butter milk which gives a rich flavor to the dish. North Indian use yogurt in preparing the quintessential homemade cooling drinks namely lassi or buttermilk. It is one of the most cooling, healthy, satisfying and comforting ingredient. Yogurt is easier to make some of the best smoothies and delights to satisfy our globalised palates. Yoghurt-based dips are popular all over the Mediterranean and in the Arab world. In a mixing bowl, add rice flour, salt, ginger garlic paste, red chilli paste and very little water and make to a thick paste. Drain off the water and add the plantain slices in the rice flour paste and mix well to coat the plantain slices well. For tempering, take some oil in a pan and when the oil is hot, add red chillies, and mustard seeds. When mustard seeds splutter, add chana dal, urad dal wash and fry until slightly roast and golden in color. Add turmeric powder, curry leaves, chopped garlic, slit green chillies, red chilli powder, pepper powder, chopped coriander leaves and little curd. Mix all ingredients well. Add the fried raw plantain slices in the curd mixture and toss well. Squeeze little lime juice and toss once again. Yogurt is mainly accompanied to cool down the irritant effect of some of the hot Indian spices. Raita is one vital dish has an awesome cooling and soothing effect. It also aids in easy digestion. Raita is an Indian garnish, dip or accompaniment which acts as a cooling flavour to the spicy dishes where it soothes the chilli effect in the curry and refreshes the palate. Raw plantains are known by various names such as green bananas, kacha kela, aratikaya, vazhakkai, cooking plantain etc. Historians state that the plantains originated in South East Asia and probably the Indian subcontinent. Plantain have a thicker skin and contain more starch. They are also a major staple food in Africa, Latin America, and Asia. They are usually cooked and not eaten raw unless they are very ripe. Plantains are more important in the humid lowlands of West and Central Africa. The raw plantain taste more or else like the potato, but it is starchier in texture. In the state of Kerala, plantains are extensively grown almost in the backyards of every house. You could make a variety of dishes with raw plantains such as chips, fritter/ bhajjis, stir-fries, stews etc. This recipe is an excellent variation of cooking the raw plantain with yogurt. Do try and enjoy making this dish. Oh my god, what's going on. Green chilies, red chili powder and crushed pepper. I am a South Indian but don't want to burn my intestinal lining. ? My mom follows every dish you make ,just love the way to explain ,thank you sir:)? Tried this recipe today , awesome taste? tried it . its very nice ur a wonderful chef...........?